Nick Page, MD of Volvo Buses in the UK and Ireland was upbeat when he addressed the press at a meeting last week. He described the past 12 months as ‘a strong year’ pointing out that an increase in volume had been achieved in comparison with the previous 12 months. He was particularly proud of the number of hybrid deliveries in London which stood at 333 in the year to date, predicting that by the end of the year Volvo would have over 800 hybrids in service in the UK. Nick was pleased with what he described as ‘the extremely positive performance’ of the retail sales operation. He also highlighted the performance of the Euro6 product range, especially in regard to fuel economy, as well as the growing popularity of soft products. These had seen a 20% rise over the year and an ‘extremely positive’ performance from the parts department with 10% growth achieved despite a falling UK vehicle parc. He also mentioned an 8% growth in dealer network labour hours sold, which was good for Volvo’s dealership network. With so much emphasis over the past year on Volvo’s electromobility ambitions, it made a change for the main topics to focus on other issues, though it was pointed out that the company hopes to conclude the previously promised Lothian City Mobility deal involving electric hybrid buses in the coming weeks. Volvo Buses believes there are big opportunities for its ecological products and is working with operators on a number of OLEV (Office for Low Emission Vehicles) bids that it hopes will be successful, though the amount available (£30m over up to three years) is somewhat limited if the government genuinely wants to achieve a great deal. Running Volvo Buses in the UK and Ireland is a six man executive headed by MD, Nick Page. A new management structure has been put in place in which the key changes are that the sales functions have now been reorganised and rather than splitting down bus and coach lines, these functions are now divided into retail and commercial sales. James Hyde takes the role of Retail Sales Director and Phil Owen that of Commercial Sales Director. Andy Kunze is the Service Delivery Director and Ian Wallace is new to the role of Product Support Director, though he has been with Volvo for many years. Completing the executive team is new Finance Director, Matt Howroyd, who joined following the retirement of Gordon Reid in March. He is not new to Volvo having previously worked for the truck side where one of his roles was Group Residual Value Manager. Volvo is offering the B8RLE MCV Evolution with 44 belted seats from stock. In Phil Owen’s Commercial Sales team there have been some new appointments. With the imminent retirement of Adrian Wickens, Adrian Felton has been appointed City Mobility Manager to handle this increasingly important aspect of the business. Emphasis is also being placed on the selling of contracts with Contract Development Manager (South) Martin McEntee set to be joined by an as yet un-named person to cover the North. Fleet Sales Managers, Dan Barwick and Phil Fletcher cover the North and South respectively. James Hyde explained that the four existing Retail Bus & Coach Sales Managers, Jo Standbridge, Richard Mann, Jim Newman and Phil Hudson have been joined by Bob McGarry covering the East Midlands and North East, while Dave Porter has become the Retail Bus & Coach Sales Manager for the Republic of Ireland in addition to his role as Customer Services Manager. Following the restructuring they are responsible for retail sales of citybuses. There have also been changes in the Service Delivery team headed by Andy Kunze. These include the appointment of Kevin Capes as Service Delivery Manager to replace Ian Wallace and Andrew Morris becoming Marketing Assistant. Andy pointed out that there are now 105 Volvo Bus service points nationally, of which 18 are customer managed. In total 15 dealers, three of which are wholly owned, provide 83 service points between them. In the Product & Support department, the two Product Managers, Norman Thomas and Daniel (Dan) Tanner, report to Ian Wallace. Each is responsible for a group of bodybuilders, Norman looking after ADL/Plaxton, Unvi, Caetano, Jonckheere and new projects, while Dan takes Wrights, VPI, MCV and Sunsundegui, with audits handled between them. On the bus side, Volvo can now boast the availability of its double deck B5TL/B5LH chassis with no less than four body manufacturer options: Wrightbus (TL/LH), ADL (LH), MCV (TL/LH) and, in open top form only, Unvi (TL). An order for 20 from Go Ahead London to be delivered next year marks the biggest order to date for MCV in the UK and the first time it has bodied hybrids for the UK. 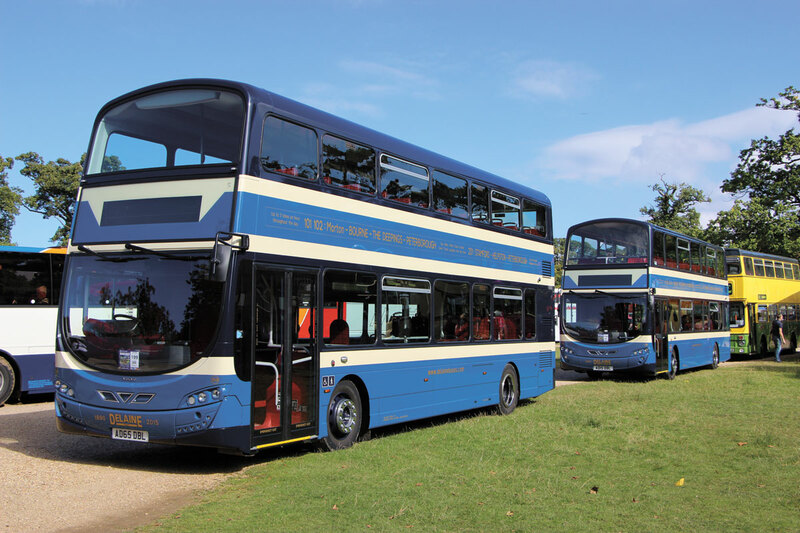 The first Unvi double decks have recently been supplied to the Bath Bus Company. Looking at next year’s double deck potential, which should benefit from a peak buying year in London, the prediction was of around 400 buses with Wrightbus bodies, potentially 125 bodied by ADL and between 70-100 MCVs. A recent B5TL delivery is this with Wrightbus Gemini 3 body for Delaine of Bourne. In the single deck market, a rise in the number of heavy duty full sized sales was predicted. 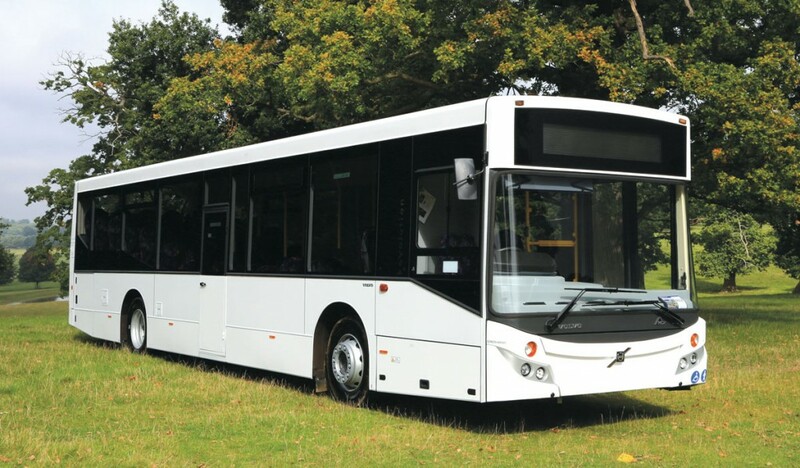 Both WrightBus and MCV can now supply on the B8RLE chassis, while Volvo’s own plant in Wroclaw, Poland which is known internally as VPI, can also supply the 7905LH and 7905LEH models. Customers for the Wrightbus B8RLE include trentbarton (11), Stagecoach (for Cambridge guided busway) (10) and Courtney Coaches (2). Stock MCVs with 44 belted seats are being offered. The coach range now includes coachwork from five different concerns, including VPI which builds the B11R 9700. Both Caetano and Plaxton body both the B11R and B8R while VDL supplies the Jonckheere on the B11R only. New are options from Sunsundegui. The last 12 months has seen the introduction of the Sunsundegui SC5 B8R midicoach which joined the SC7 B11R and has proved something of a surprise hit. An initial batch of ten rapidly sold out, as did an additional ten and as a result a third batch have been ordered and are in the course of delivery. Coming in the Spring of 2016 is a new Sunsundegui/Volvo alternative in the shape of the new SB3 body on a B8R chassis. This 12.2m long vehicle will be 3.5m high over the air conditioning and will be equipped with 72 seats. Pricing will be ‘competitive’. We’ll bring you more on it when the first ones are built. It was estimated that in 2016 around 400 coaches would be sold, split 70/30 between the B11R and the B8R. Nick Page confirmed that Volvo had no unsold Euro5 powered units in stock. Many of those in coaching will remember the days when a visit to Volvo’s coach centre headquarters at Coventry and before that Loughborough would present the visitor with a massive array of used coach stock, some of it untidy and needing attention before it could be used. It isn’t like that anymore because not only do the premises now present a much more professional appearance, they don’t house anywhere near the same number of used vehicles, and the condition of those that are there is of a much higher standard. It marks the successful outcome of a turnaround that began with the move in 2010. The smaller size of the premises dictated a different approach and though the capacity is 70 vehicles the average is now nearer 35 in stock at one time. This has come about with a change in approach as well as a change in the market. Volvo now prefers to take in vehicles up to five years old, prepare them to a good standard and up-seat if necessary. It is also selling around 50% of vehicles prior to them arriving in the yard. The vinyls on the 9700 are a reference to the latest safety features to be added to the long list already featured on the product. This is a case of Volvo introducing systems that will become mandatory in 2018 ahead of their requirement. These are: Collision Warning & Emergency Braking, Lane Keeping Support and Adaptive Cruise Control. Lane Keeping Support is a lane departure system that uses a forward facing camera to track the road markings and warn the driver, audibly, visibly and through the vibration of his seat if he begins to stray out of lane without indicating. The Collision Warning & Emergency Braking system uses both radar and camera systems to provide its input. ACC is not mandatory but will be standard on the 9700 and an option on other models. Outside, the products involved will be another B8R Sunsundegui SC5 providing a ride and drive opportunity, along with a B11R Jonckheere JHV and an MCV bus bodied B8RLE. There will also be a Volvo on the Wrightbus stand which is adjacent to the Volvo display. Launched at the show will be a new version of the Volvo App, reflecting the latest corporate guidelines, that will be available on the iPhone, iPad and Android platforms. There was news of some of the orders Volvo has won for 2016 in addition to the MCV hybrids for Go-Ahead London. FirstBus will be taking 20 Wrightbus bodied hybrids; Plaxton is taking eight more Plaxton Elite bodied B11R 6x2s; National Express has placed an order for 52 Caetano Levante bodied B11R 6×2 tri-axles; Parks are taking 25 B11R 4x2s with a mix of Jonckheere and Plaxton bodies; Lochs & Glens are buying ten B11R 6×2 Jonckheeres and there are also over 20 orders placed with the retail organisation for coaches of various specifications. With a smaller market than in the past, Volvo is conscious that its total vehicle parc is also dropping, albeit slowly (by around 700 over a five year period it was suggested) although within this figure the percentage of older vehicles that tend to be serviced with non-manufacturer parts is growing. Maintaining a critical mass to justify the size of the support organisation is one of the things driving an increased emphasis on getting closer to customers and trying to use the network to meet more of their needs through such means as contract maintenance. Success in this is reflected in increases in parts contracts and hours sold in dealer workshops and by Volvo Frontline technicians. Increased technical complication is a significant factor behind this rising demand, and suggests that this greater reliance will be a continuing trend.